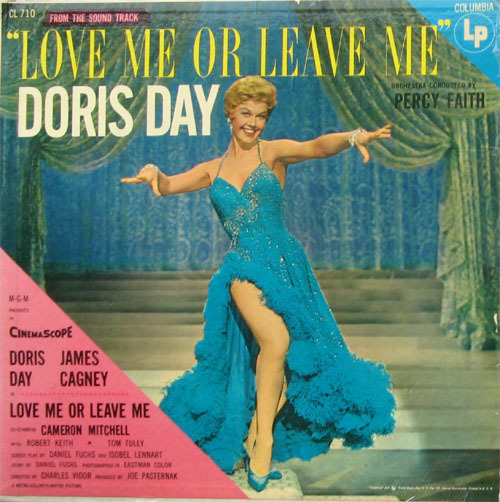 LOVE ME OR LEAVE ME is a 1955 showbiz bio that for once sticks reasonably close to the facts, in this case those surrounding the career of 30s songstress Ruth Etting and her love/hate relationship with her mobster mentor. As Etting, Doris Day gives the best dramatic performance of her career, and she sings ten songs from the period in high style. Day was at her vocal peak, showing a sensual side that’s been forgotten in the wake of the frothy comedienne persona that dominated her latter efforts, and sidelined public and critical perception of her talents even as she hit boxoffice heights. Along with DD in top form, what gives the movie its extra boost is the ferocious job from James Cagney as ‘The Gimp’, the ruthless, domineering, obsessive hoodlum who ran Etting’s career and life, driving the lady into not just the big-time, but into by-ways of alcoholism and despair. It’s the hottest acting heist he’d pulled since White Heat, six years earlier, and is one of his half-dozen top creations. The movie swiped an Oscar for Story, and Jimmy was nominated for Actor. The Screenplay, Music Score, Sound and Song (“I’ll Never Stop Loving You”) were also on the Academy roster. Directed by Charles Vidor, running a well-defined 122 minutes, it brought in close to $6,000,000. Also on view: Cameron Mitchell, Robert Keith, Tom Tully, Harry Bellaver, Peter Leeds, Henry Kulky and James Drury.